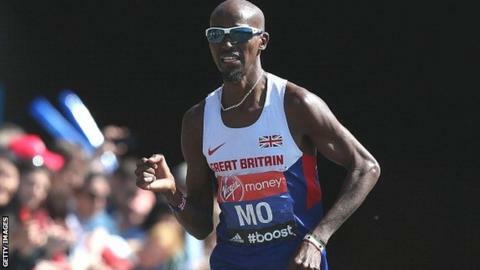 Double Olympic Champion Mo Farah has pulled out of Sunday's London 10,000 as he is not yet fit enough to race. Farah, 31, was set to defend his title in the 10km road race, which would have been his first scheduled competition since the London Marathon in April. His agent Ricky Simms said in a statement: "He took a few weeks off training, went on holiday and just resumed jogging 10 days ago." The Briton finished eighth on his marathon debut on 13 April. He broke the English record over the distance, but will now focus on the track after confirming last week he would take part in this summer's Commonwealth Games in Glasgow. Farah's team-mate Andy Vernon, who claimed the British 10,000m title two weeks ago, and Ryan McLeod have been added to the field.